It's not stalking if you have a licence: Happiness is.....? An open door. Or at least a lock that will open. Recently it was my birthday. You didn't have to get me anything, which is just as well as you didn't. That's okay, I bought myself a few tools instead - mainly to replace ones I had lost recently. 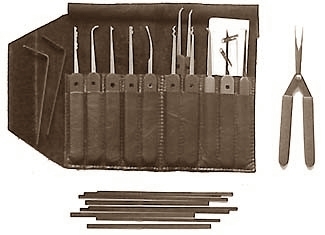 And one of my first purchases was the Peterson 'Government Elite' lockpick set. As I have mentioned previously, there are some very limited circumstances where I have the legal right to enter a premises - whether or not the occupants are there. Rather than calling out a locksmith, or beaking a window, I generally resort to picking a lock. Lockpicking is one of those arts that is simple in theory but can be anything but in practice. Until earlier this year, I had an entry-level (bad pun not intended) SouthOrd set that I had some success with, even if I do say so myself. Until someone stole it, but that's another story. So when it was time to get a replacement set, I felt I ought to step up to the next level - or perhaps miss a few levels entirely - and spend considerably more. Which, as it turned out, is exactly what I did. Not just on the 'Government Elite' set (which was expensive enough) but also the SouthOrd E500XT electric pick gun. The madness behind my method, or vice versa, is that while manually picking a lock with a mighty fine set of pics is aesthetically pleasing, sometimes speed is of the essence. Research led me to believe that an electric pick gun is just the ticket to the reliably consistent, and quick, opening of locks. Well, actually, that's not quite the case. Like everything else in life, things take time and practice. When I've got some free time, and the inclination, I'll putter around with several different locks I bought for this purpose. I had to buy practice locks because Manson thinks I damaged his front door deadlock the last time I 'let myself in' and refuses to allow me to practice on it again. Hardly fair! Today was a good day - I've finally cracked the simpler 5-pin cylinder lock (standard on most front doors) both with the manual picks and the electric gun! Not only once, but now can open this lock in about 5-10 seconds with either method, repeatedly. That brings me no small amount of joy but it's no time to rest on my laurels. The 5-pin cylinder lock is fairly basic as far as locks go and just because I can pick this particular one quickly doesn't mean that another one won't prove a problem. But, for now, I have a Lockwood 6-pin padlock to crack.